Welcome to Down On The Street, where we admire old vehicles found parked on the streets of the Island That Rust Forgot: Alameda, California. 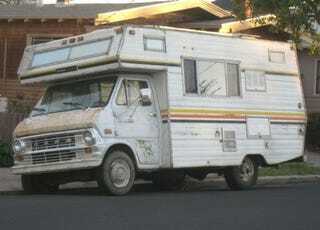 Here's a front-engine Econoline with Aristocrat RV conversion on the back. I was in a rush when I spotted this well-used classic, so I couldn't get many photos; since then it hasn't returned to this spot. My knowledge of vintage campers isn't so great, so we'll need to depend on our more knowledgeable readers to fill us in on just what we've got here.